This is another of the exceptional micro breweries coming out of New Zealand. Croucher is gaining popularity in Australia and can be found on tap at a number of restaurants around Melbourne. The Pale Ale is also quite good but this is the first time I will be sampling the Pilsner. 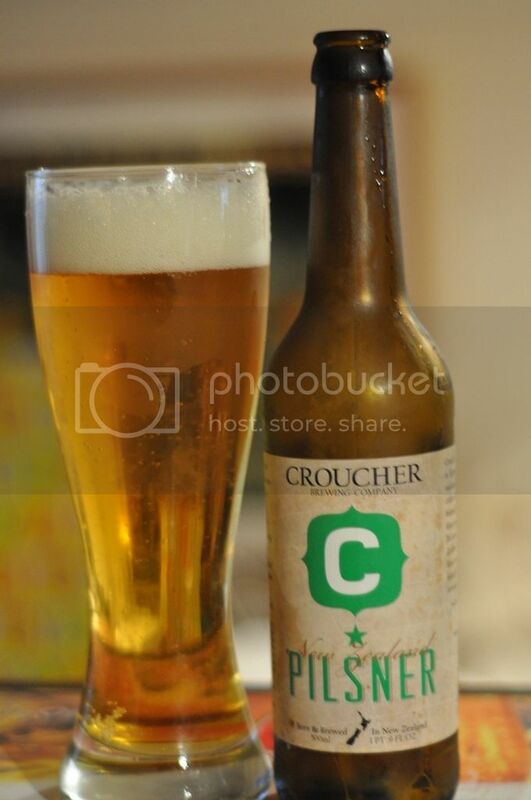 Croucher New Zealand Pilsner is supposed to be a New Zealand twist on this traditional style. It stays true to the style by using lots of hops, but they are Motueka and Riwaka varieties both found only in New Zealand instead of the traditional Saaz. What it all comes down to though is does it taste good, and I think it's time to find out. This beer pours absolutely sensationally! The colour is a nice clear golden colour with a thick white head on top of the beer. There are lots of small bubbles rising to this head which settles to a full finger full of head. I don't think you can ask for a lot more in a Czech Pilsner, the beer is crystal clear and looks incredibly appetizing! When you first smell this beer, the attack of strong New Zealand hops is like being punched in the face. There are grassy hops everywhere, with a backing of strong herbal and citrus smells. There is also a hint of tropical fruit towards the end of the nose. The tropical fruit smell is similar to passionfruit and provides a slightly sweet contrast to the incredibly bite that the hops are offering. What a simply sensational nose! Croucher have produced a seriously tasty beer with their New Zealand Pilsner! It has a heap of flavour without losing that beautiful Czech Pilsner feel. The senses are overloaded by the vicious hop flavour right at the start before slightly fading away to be replaced by mild grains, some passionfruit and plenty of citrus. The hops return at the end of the palate and leaves a delicious bitterness. The beer is crisp and one of the best examples of this slightly new world Czech Pilsner. The flavour of this beer is excellent! I'm a big fan of pilsners and when I tell other beer nerds my favourite beer is a pilsner they all look at me like I'm crazy. Emerson's Pilsner is my yardstick, and Croucher's effort is pretty close. This is one of the most sessionable beers I've ever had. The carbonation bubble on the back of the tongue adds crispness and is simply brilliant! This is one that you should definitely try! If you see it on tap, it doesn't matter what else is on you must try this beer!